From her secret perch at the top of the stairs, seven-year-old Gabriella watches the guests arrive at her parents' lavish Manhattan home. The click, click click of her mother's high heels strikes terror into her heart, as she has been told that she is to blame for her mother's rage - and her father's failure to protect her. Her world is a confusing blend of terror, betrayal and pain, and Gabriella knows that there is no safe place for her to hide. When her parents' marriage collapses, her father disappears and her mother abandons her to a convent, where Gabriella's battered body and soul begin to mend amid the quiet safety and hushed rituals of the nuns. And when she grows into womanhood, young Father Joe Connors comes into her life. Like Gabriella, Joe is haunted by the pain of his childhood, and with her he takes the first steps towards healing. But their relationship leads to disaster as Joe must choose between the priesthood and Gabriella. She struggles to survive on her own in New York, where she seeks escape through her writing, until eventually she is able to find forgiveness, freedom from guilt, and healing from abuse. 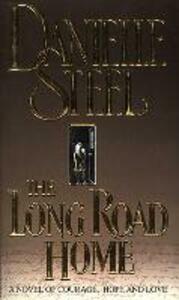 In this work of daring and compassion, Danielle Steel has created a vivid portrait of an abused child's broken world which will shock and move you to your very soul.